Concrete patio was so damaged at our site that we had to place outdoor rugs in order to prevent falls by us or guests. Although they state it is a 55+ Park, there were children in the the single wide rental trailers in the park. Sites are priced on location and the back-ins that have a field behind them are considered "premium" sites. However, the traffic noise from I-8 is very bad at these sites because of grooved pavement. Not to mention the trains which seem to increase at night; one night counted 7 trains between 2:00 a.m. and 3:00 a.m. Pool is solar heated so if the temperature goes down, no warm water. Never saw anyone using pool and only once saw anyone using hot tub since you have to schedule an hour in advance in order to have it heated. Showers are $1.00. If you shower in your rig, no water pressure as they are watering grass daily. Electricity went down twice during our time there because of too many rigs using heaters(??). Activities are mainly music oriented except for Texas Hold Em games. Fortunately, Yuma is close so you can go and find something to do. Discovered that there were many nicer parks in Yuma where we could have stayed for much less and enjoyed many more activities, including pool, hot tub, pickle ball, etc. We will not stay at this park again and do not recommend. We camped at Sans End RV Park (55+ Park) in a Fifth Wheel. Wonderful RV Park, well maintained, super friendly staff, many activities. We loved this place and would be there now if we didn't have so much to take care of in the rain country. Beautiful pool, palm trees, level pull through. I do believe this is the best RV park we have ever stayed at. We will be back. This trip was primarily for dental work in near by Los Algodones Mexico. We had a blast in Mexico. Great places to eat a fun shopping. We camped at Sans End RV Park (55+ Park) in a Motorhome. Off season rate $18 night. Close to Yuma & Mexico. We were in the shady area. Site was a bit tight to navigate into & out of due to trees but not bad. Nice owners, great price, would definitely stay again. We camped at Sans End RV Park (55+ Park) in a Fifth Wheel. We went here for two nights to meet up with friends. First off, let me say, this place has made perhaps the best use of mature palm trees of anywhere we have been. No matter where you are, or where you look, it is magnificent. Sites are gravel, and quite level. Hookups were fine. Wifi is from a service provider @ 3.95/day, but it is good quality as park wifi goes. Reasonably fast, reliable, consistent. On the down side, the park boasts its low rates, but maintains them by cheaping out like a discount airline. 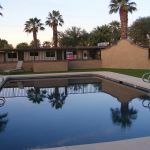 You have to call to arrange pool or hot tub access. For the hot tub, call an hour ahead so they can heat it up. Showers are a dollar (if you shower fast), and you need to be sure to run the sink hot water first, or your shower will be cold. (As per park instructions.) Our site was VERY small, requiring we park our toad beside the coach, leaving us almost no room to sit outside. Park roads would be reasonably generous, but the tight sites and the size of modern campers means cars and large trucks parked, and least in part, on the roads throughout the park. Has potential, but we would not stay here again or recommend it. We camped at Sans End RV Park (55+ Park) in a Motorhome. Dirt roads in part covered with gravel. Not a 55-year-old are going to let kids live there. Cannot use swimming pool because they will not heat it even though the park was full of people. The game room is a joke, roof leaking like a sieve, water running in on floor when it rains. Your big thing at this park is having music or jam sessions about three times a week. Music is he saying all country western depressing music off base. You have to pay to take showers and you have to pay for the Internet, no TV service available, dogs run wild and people do not pick up after them. This is probably a good place to stay for one or two nights to go into Mexico to have dental work done; otherwise find something that would work for you. Seems like the managers are friendly. They spray the wrong road with water every Wednesday and Sunday so your vehicle gets mud all over as you leave also you have no water to take showers as they are filling the water truck to spray water on the road to keep the dust down We camped at Sans End RV Park (55+ Park) in a Fifth Wheel. Our first stay, and are VERY pleased! Very clean. Personnel are very friendly and helpful. We plan to come back every year as long as we are able. This will be our winter home. We camped at Sans End RV Park (55+ Park) in a Fifth Wheel. Requested a site for satellite on top of rig and they parked us where palm trees blocked the signal, had to move. Park is fairly empty, yet they continue to park people right next to someone else, very tight. Park is very dusty, except when the water truck runs, then it is muddy. Internet is $1 a day, passed on that. Went swimming in a cool pool, then went to the ladies room to shower and was surprised to find out there was a $1 charge for a shower!! So went home and showered in the coach. 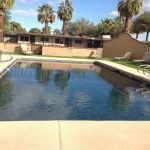 Close to Algodones and convenient to town. Will probably find somewhere else to stay next time we need to visit Yuma. We camped at Sans End RV Park (55+ Park) in a Motorhome. This facility is only good for about a night or two. They charge for wifi and even the showers (that's just not right). Of the 3 showers in the men's room two were out of order. There are two sections with some differences. The lower section is non-pets, while the upper section is pets. The concept is good, however the lower section is clearly better with more manicured sites. Even still the entire place is cram packed with little or no room. Slide outs almost touch. There is mostly dirt and they go by with a water truck daily, which leads to standing mud holes. Hard to understand why they don't invest in rock. Dirt will get dragged inside your camper even with a outside rug. With so many RV's stuffed in one place it is noisy and crowded. The only advantage to staying here over a casino lot is the full hookups. Beyond that is it just too uncomfortable to stay again. We camped at Sans End RV Park (55+ Park) in a Fifth Wheel. Staff was very friendly. The park undergoing overdue maintenance, so it is still in need of some upgrades. It has dirt roads and a water truck comes by watering the roads to keep dust down. that makes for mud along the streets. Wifi is only a $1/day, but reception is spotty. You need to take your computer close to the office to get reliable service. I was only able to connect once at my site in the 7 days we were there. there is a park table close to the office where I observed people sitting with their computers. Very pet friendly, and they have a pet walk area, but no off leash area. Overall, I would recommend the park to others, but just be aware that it is not an "upscale" park, but the price is good. It is an over 55 park, so no children are there. Park has activities scheduled, and folks are pretty laid back. We selected the park because of it's close proximity to the Mexican border. We camped at Sans End RV Park (55+ Park) in a Motorhome. I know this park has gotten more than its fair share of poor reviews in the past, and perhaps deservedly so, but the new managers - Michael and Christine - are working very hard to change all that. The park itself is laid out well, with long, wide gravel spaces with long cement pads and grass borders, 50amp, a nice pool and hot tub, a recreation hall and a game room, beautiful palms, and roads wide enough to comfortably negotiate. There is a wee bit of freeway noise and the occasional train, but it's very minimal. This is a very socially active park, thanks almost entirely to the new managers. Our first night there we were invited to a free potluck, of sorts, where the park provided huge, perfectly baked potatoes and a vat of chili, and everyone brought their own toppings to share. This park is a work in progress, and the new managers have already made many improvements, and I predict it won't be long before it's widely recognized as a 5-star resort. We camped at Sans End RV Park (55+ Park) in a Motorhome. Had hoped to use the laundry but all but two machines were 'out of order' and those two always in use, so I had to drive into Yuma to use a laundromat. This was a rather noisy park in unpleasant surroundings and I would only stay here again if I had no other choice. We camped at Sans End RV Park (55+ Park) in a Motorhome. If you want to pick up General Delivery mail at the Winterhaven Post Office, you have to go between 2:30-4:30 pm. The 'grocery store' in town has very little to offer. Friendly lady at the desk, 50 amp, and shade trees. We were parked on dirt, but there was a picnic table. Swimming pool was locked, game room with pool table , dart board & poker tables. Coin operated showers & a laundry. No credit cards, no ice, about 1/2 mile to town with a post office, small grocery store, liquor store & several PayDay loan places. 4g internet with the MiFi on the Verizon network. 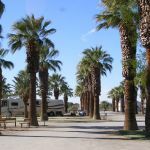 They have part of the RV park for RVs with pets plus there is a specific dog walk area. We camped at Sans End RV Park (55+ Park) in a Motorhome. If you are traveling with your dog, and it rains while you are staying here, you will be walking your dog in mud. You are not allowed to walk your dog on leash, anywhere else in the park. During our stay I was accused by the owner of not picking up after my dog. This was not true, but even though he saw I was carrying my little bag to the garbage, he chose to continue to lecture me. We will not stay here again. 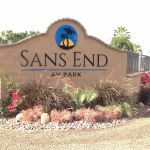 We camped at Sans End RV Park (55+ Park) in a Motorhome. Needed to dump tanks and do laundry etc after dry docking in Yuma. Seems like a nice place-Many people gathering for potluck-looked like regulars seasonals. Spaces are narrow for big rigs but got our 4 slides out- Trees on either side were tricky to park under, but doable. No TV reception except for Mexican stations. Verizon air card worked great. Only one small house pet allowed-but exceptions can/must be approved by office. Pet owners are parked in separate area from other campers. We have 2 cats and were put here as well even tho cats are indoor cats. Strictly over 55 park. Did not use other facilities. Close to Algodones Mexico was a plus. Would stay again. We camped at Sans End RV Park (55+ Park) in a Fifth Wheel.